The Stirling Christmas exhibition in the Stirling Smith contains many iconic images from the recent past. This photograph was taken from a bus on the Glasgow Road, Stirling, on a grim winter’s day, giving the bus driver’s view. The photographer was A D S MacPherson (1913 – 2009), a freelancer. Living in Stirling, he took great delight in photographing both the old town and new developments such as the University, which opened in 1967. His work was highly regarded, and his photographs appeared in half page format in the Scotsman and Weekly Scotsman, as well as featuring in their annual calendars. All of his pictures were developed and processed in his home in Stirling. He presented a large collection of his best photographs to the Stirling Smith after his retirement in 1982. 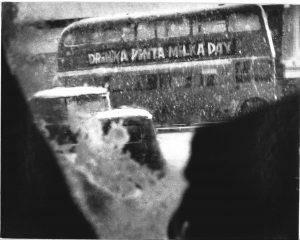 ‘Drinka Pinta Milka Day’ was a national Milk Marketing Board campaign which started in 1958 and ran for many years. From 1958 – 1993, they also ran the 1500 mile Round Britain Cycling Race. This came to an end with the deregulation of the market in 1994. The exhibition is packed with Stirling memories – Stirling Annuals from the Drummond Tract Depot, Stirling Observer Annuals and toys and games from the recent past. As always, admission and parking are free, with closures on 25 – 26 December and 1 -2 January only.